In the summer of 2005, Hurricane Katrina tore a city apart but pulled people and pets together. The nation learned the hard way -- from refugees who fled the area -- that people do not want to evacuate without their pets. 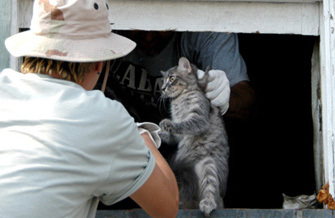 Going forward, the way animals are treated during disasters was changed forever with the enactment of federal legislation ensuring that evacuation plans for humans must also include their animals. For Best Friends, it was an entry into what would include several more rapid response efforts. It was late August 2005, after the breach of the levees separating the lower Mississippi River from the below-sea-level bowl of New Orleans, that people fled their homes. Most were forced to leave their pets for what all expected would be just two or three days. When days turned into weeks, the animals were forced to fend for themselves. Best Friends Animal Society was there on the ground, and the first in the water, rescuing roughly 4,000 animals from a temporary triage center in Tylertown, Mississippi, transporting another 2,000 while stationed at a temporary rescue center also in Mississippi, and, later, rescuing and transporting another 1,500 from a temporary center in Metairie, a suburb of New Orleans. The first national animal rescue team in the water were Best Friends' staffers Jeff Popowich and Ethan Gurney, who were deployed to the Gulf Coast in the early days following the storm. Not far behind them and on the ground in early September was Sherry Woodard, who said it was "the animals who touched me deeply." Among them was a pit bull terrier named Bunker, who, for Woodard, who was in charge of kennel operations at the triage center in Tylertown, was representative of so many Katrina animals who learned how to survive. It took a determined gator hunter and Popowich to wrangle Bunker, who had made his stomping grounds in a gated community on the West Bank of New Orleans. 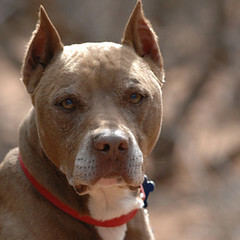 Because of his ominous size and cropped ears, residents were frightened, and so was Bunker, especially because animal control and neighborhood security officers had been chasing him for weeks. He eluded them by jumping into a man-made lake and by swimming across a moat to the other side of the golf course greens. "Bunker was living around the green on the ninth hole," Popowich said at the time. Once caught, and the stress of the storm, his life on the lam, and his dramatic capture were behind him, a different side of the oversized dog emerged. He became a Teddy bear. "I think Bunker is a great example of many of the dogs we met later in our rescue efforts," said Woodard, Best Friends" animal behavior consultant with the Search And Service Dog program. "He was scared when we met. He was displaying defensive behavior. When he finally was able to show his true behavior -- who he can be and maybe who he once was -- we laughed and cried watching him sit up like a small dog and play with toys, sleep on staff beds, [and] cuddle with everyone." Also part of the Best Friends team were volunteers -- individuals and groups -- putting their lives on hold to help other people's pets. It was exactly that team spirit that made saving the rescues possible. Woodard remembered well the volunteers who worked tirelessly by her side. She thanks them all -- those who helped from home and those who traveled to the center, literally moving in with the animals and other workers. "I see people often here at the sanctuary who were living in our shared yard," she said. "I have kept some great friends from Tylertown who I have stayed close to. They have joined me working at other events, visited here and met across the country to stay connected." The scale of the damage from Katrina and its aftermath "was such that no single organization or government agency could presume to be able to relate the effects single-handedly," noted Francis Battista, a Best Friends' co-founder who helped manage the triage centers. "The same applied to those of us concerned with the well-being of the animals impacted by the storm." "Best Friends was the first national animal welfare organization in the water and the last to leave some nine months later," he pointed out, "but from day one, we worked in collaboration with other organizations, large and small." It was the St. Francis Animal Sanctuary operators who "welcomed us and allowed us to set up an emergency shelter on their grounds in Tylertown." First partnering with local animal control in Louisiana to shelter pets of evacuees, Best Friends worked with other national agencies on big-picture operations and with local rescue organizations across the country and Canada to provide foster care for the displaced pets. It was what Battista described as a "cross-organizational cooperation" that was "something entirely new for animal welfare." "When lives were on the line, differences were set aside and we got on with the work of saving the animals," he continued. "The trust and friendships that were built under the gun of Katrina changed the face of animal welfare in the United States and opened doors that would have otherwise remained closed. "As a result, we live in a different, more collaborative world and the animals are the beneficiaries." Which comes back full circle to Bunker, one of those animals who benefited directly from the collaborative effort. Today, Woodard said, "Bunker is living in a loving adoptive home in Florida. He shares his life with other dogs and continues to impress people. I love being a part of helping Bunker. He needed a team." Consider making a gift to make the world a better place for animals in need.